It’s during St Patrick’s day that I take some particular note of Irish stereotypes; not all of them are good. Alcohol consumption is one example. Who would have thought that among European nations the French, Austrians and Estonians downed more of the stuff per capita than the Irish? But the French are connoisseurs and wine is a national passion and the Irish are, well, they’re Irish. I have a special disdain for Notre Dame’s pugnacious, leprechaun-like mascot. He’s that little, angry green guy with a shamrock on his cocked hat and his dukes up. He depicts, I suppose, the Fighting Irish moniker for the University. Like many stereotypes they usually convey an element of truth and the good fathers at Notre Dame are not alone in seeing a combative element among all those Irish saints and scholars. But it wasn’t Irish sanctity or scholarship that finally won independence in the last century from centuries of British oppression. Keeping that Irish fighting notion in mind I prefer a more positive image and the Irish in America have played an important role in our country’s military and her conflicts. The numbers indicate that the Irish have done their share of that in service to the United States. There were 3,464 such Medals awarded up to 2010 and an estimated 2,018 of those went to Irish Americans. That’s estimated to be more than twice the number awarded to any other ethnic group. 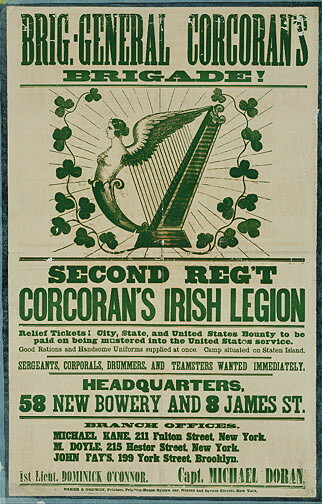 Irish-born Americans were awarded 257 medals which is more than half of all foreign-born recipients. A monument to these Irish-born Medal of Honor winners is located at Valley Forge’s Medal of Honor Grove. Perhaps most remarkably, of the very select 19 double medal recipients five were Irish-born and at least another three were of Irish descent. So if there’s a bit of combativeness in the Irish it has served our country well. 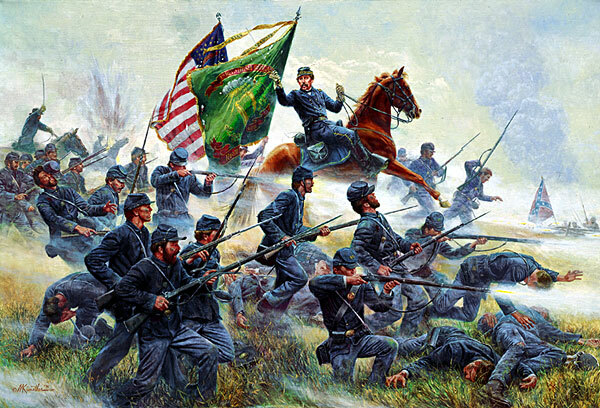 Maybe Notre Dame’s Fightin’ Irish ROTC should take on the task of finding a more gallant and representative image of the Irish contribution to this country. Pickin’ & Grinnin’: Linda and I were privileged to be invited to spend last Sunday afternoon at the Amelia Island home of Lori and Ned Flemming, their daughter Jane, and Lori’s dad Smoky Coe, where we were treated to a session with Smoky & the Bandits, a local country/western/rockabilly quintet that had us constantly grinning, toe tapping and applauding. We listened as the group played a variety of classic outlaw tunes and some old blues/rockabilly sounds. Every song was a pleasant surprise and you never knew what was coming next, particularly when they cranked out an old Phil Harris song. Pictured (left to right) Steve Mason, Brett Welsher, Smoky Coe, Lori Flemming, Jane Flemming. The group consists of Smoky Coe, rhythm guitar and vocals; Brett Welsher on Dobro; Steve Mason, lead guitar and vocals, Lori Fleming, upright bass and vocals; and Jane Fleming on fiddle. There’s a 72 year age difference between Smoky (86) and his granddaughter Jane (14) but there no musical generation gap here. And for those of you who are wondering, a Dobro is an acoustic guitar with a metal resonator built into its body which serves as an amplifier and is played with strings facing up like a lap guitar. I’m not 100 percent sure but that twangy sound so common to country music probably emanates from a Dobro. By the way, Dobro player Mr. Welsher, accompanied the late legendary country singer Dottie West on numerous occasions. Texas native Smoky, who performed with the late Jim Reeves penned the smash hit “Good Intentions” for Randy Travis that is on his best-selling album “Always & Forever,” has been playing and singing for more than 75 years. Folks, this is an eclectic group with mom Lori a marketing executive with a nationwide insurance firm; fiddling daughter Jane, a 9th grader; non-musical dad, Ned, an artist with a studio on South 2nd Street above the Villa Villekulla Toy Store and across from Pajama Life; and guitarist Steve Mason, a nuclear plant inspector, songwriter and producer who also owns his own recording studio hereabouts. For more information checkout Steve at twopmjunction.com, email him at twopmjunctiongmail.com or call 904/206-0507. 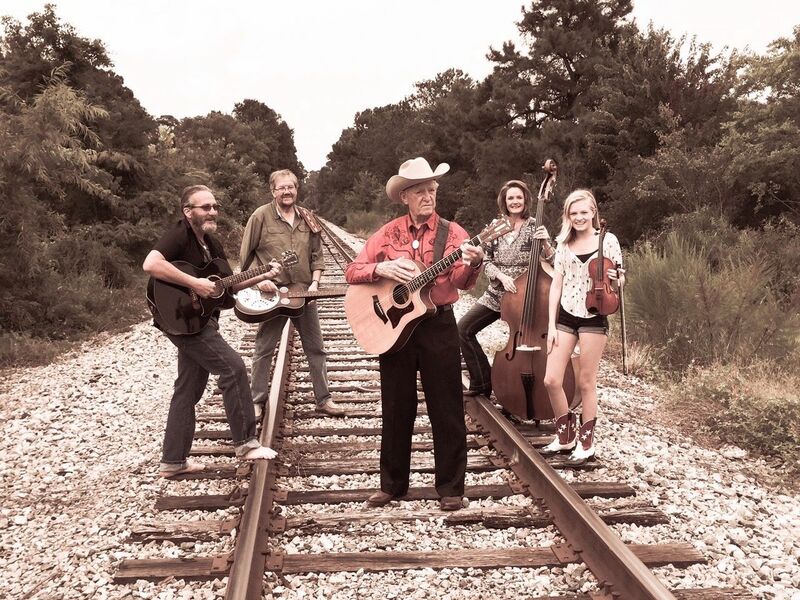 For contact information on this fun and very entertaining group go to http://www.facebook.com/smokyandthebandits or call for bookings at 704/953-9780. The Daily Newspaper — RIP: Last August 19 Florida Times-Union Editor Frank Denton wrote a column where in the very first sentence he said that the annual subscription price for his paper would now be $523.08, going on to explain that the increase was due to a dramatic drop in advertising, particularly national ads. He explained that the digital age has not been kind to daily newspapers across the country, his included, and that subscribers are now being asked to pick up the cost of production and distribution. When I received my bill for the T-U’s seven-day delivery it came in at a whopping $582.13, $59.05 more than Mr. Denton reported last August. I was told by Circulation Director Amy McSwain that my invoice reflected a “subscription rate increase” on December 1, 2016, just three months after Mr. Denton’s column was published.” My wife, Linda, and I grew up in homes that subscribed to daily newspapers and have subscribed to one almost all of our adult lives. Because I was a reporter for the now shuttered Tampa Tribune makes the demise of the nation’s dailies even harder to swallow. But a 162% increase from 2012 ($222.39) to today probably makes this the last year I’ll subscribe. I want to continue to sit in bed each morning with a cup of coffee and a newspaper, not a cup of coffee and a gizmo like an iPhone, iPod, or laptop, but I’m afraid that after this year the T-U will be unaffordable, and if it loses the hearing aid and mattress store ads, it’ll probably disappear altogether. Campus Craziness: Yale University announced that it has changed the name of its Calhoun College and that it will now be called Grace Hopper, for a computer scientist and naval officer, and no longer stained by the name of slave-holder John Calhoun of South Carolina, who graduated from Yale as valedictorian in 1804, went on to serve as a vice president under two presidents and a South Carolina senator famous for his oratory. The slave-holding business was just too much for the snowflakes who attend and run Yale, but they have a long row to hoe. Calhoun certainly owned slaves, but so did Timothy White, Benjamin Silliman, Ezra Stiles, Jonathan Edwards and John Davenport, all of whom have Yale colleges named for them. While owning slaves is not something that modern day graduates are eager to put on their resumes, Calhoun was known for his “just and kind” treatment of slaves and his integrity. I guess it doesn’t matter to these twits that Elihu Yale, the college’s namesake had his slaves flogged, hanged a stable boy for stealing a horse, and was removed from his post in India for corruption. Oh, despite the fact his donation of books and goods made him the founder of Yale College, Elihu Yale never once stepped foot in New Haven. Maybe the loons that run the university could take a hint from the “artist formally known as Prince” and call it the “college formerly known as Calhoun.” I’ve always thought that “Locks” would be good nickname for this nutty Ivy League school as they appear to have a lock on misguided, whacky political correctness. Parents actually cough up $60,000 and more for their kid’s tuition to this institution where they are taught what a wild and fun-loving guy ole Vladimir Lenin was and how courageous it was of Che Guevara to tie people to posts and shoot them. Oh, they also get to ridicule Christians for their faith, assault guest speakers they disagree with, and upon graduation travel to third-world stink-holes, blame the U.S. for the misery there, come back to the States and join the Democrat Party, vote for nut jobs like Bernie Sanders and then demand that the rest of us pay for their health care. I’m sure mom and dad are proud. A Presidential Toast: Last month we celebrated President’s Day and it’s appropriate I think to raise a glass to Abe Lincoln as he may have been a guy I’d like to have had a beer with and it appears that he might have even picked up the tab. I’ve been introduced to a quote by a former IBM PR colleague informing me that Lincoln once said in a speech: “I am a firm believer in the people. If given the truth, they can be depended upon to meet any national crisis. The great point is to bring them the real facts, and beer.” Facts and beer get my vote. Things I Wish I Had Said: To get something done a committee should consist of no more than three people, two of whom are absent. — Robert Copeland. No-Talent, Failed Activist Seeking Job: Now that former San Francisco quarterback Colin Kaepernick is looking for a job in the NFL he says his national anthem protest won’t carry over into next season. Kaepernick, either sat or kneeled while The Star-Spangled Banner was played before Forty-Niners games last season, a protest he said was meant to draw attention to racial inequality and police brutality. First of all, now that he says that he’ll no longer sit is too late. What coach or owner wants this no-talent distraction in their locker room? In addition to the fact that he’s toxic to fans, he stinks as a player. I don’t think ESPN would even hire this train wreck. Jet Skiing On The Fly: George Morris, the affable owner-operator of Flying Fish Jet Ski Adventures in the downtown harbor has announced a number of changes including that he will no longer be operating out of the downtown harbor and that he has changed the name of his company to George’s Jet Ski Adventures. The name change, George says, comes since many folks appeared to be under the impression that George was operating a fishing operation and the location change because it gives him the flexibility to operate almost anywhere there’s water. George purchased a trailer that enables him to haul his newly refurbished jet skis around the island and launch them at various boat ramps, thus giving him more options for his tours. And for the first time he will be offering rentals in addition to his tours, with rental times ranging from one hour to an entire day. George can be reached at 904/3101-5999. His web site remains http://www.flyingfishfun.comuntil updates are completed. Drinking, Dining & Dancing: Sunday, March 5, on a whim we decided to drive over to the Sand Dollar Restaurant at 9716 Heckscher Drive, just a few hundred yards from the St. Johns Ferry crossing for a drink and early dinner and we’re glad we did. 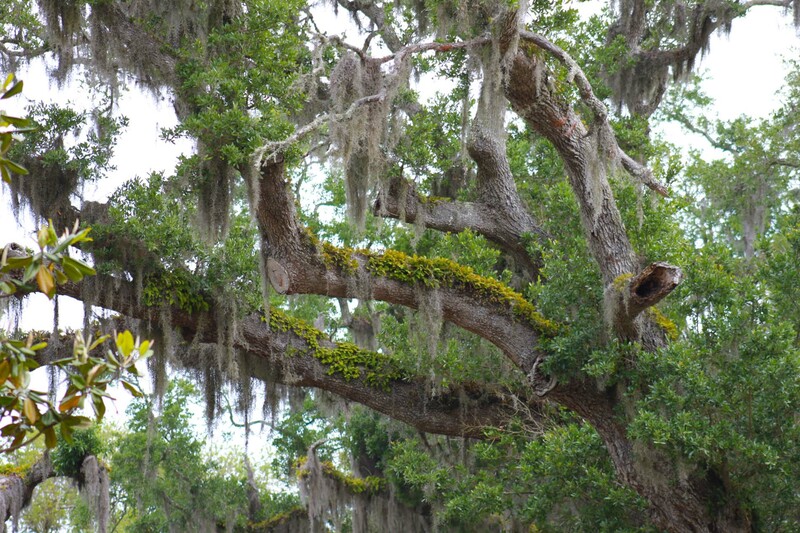 The short drive from our house down Fletcher and A1A past the Omni Plantation then across Big Talbot and Little Talbot Islands until we reached Heckscher Drive never fails to awe us with the views of Grady Bridge fishermen, dunes and sparsely populated beaches and blue ocean. Arriving at the Sand Dollar about 4:30 p.m. we sat at the outside bar where we were served by a gregarious and efficient new barkeep Elana who had been on the job for all of five hours, but displayed the aplomb of a veteran employee. We ran into Fernandina friend Flip Gallion who took advantage of the sunny 80 degree weather to ride his motorcycle to the eatery. Elana parked us at a deck table where were ordered the $40 for a blackened seafood platter for two with three sides that was far more than we could eat as it included generous helpings of shrimp, scallops, fish filets, clam strips (fried), deviled crabs and hushpuppies. The platter also comes fried and grilled. The combination of excellent food, great views, delightful servers and reasonable prices guarantee that we will be back. They are open seven days a week beginning at 11 a.m. and have live music on the spacious deck depending on the day. Call ’em at 904/251-2449. If you like Mexican food but aren’t as fascinated as the Latin employees in the island’s Mexican eateries are with watching Arequipa, Peru play Montevideo, Uruguay in kickball in Spanish on every TV set in the joint while dining on a broiled budgie with a side of minced rodent lettuce wraps and some chips and red stuff in a little bowl, then head over to Halftime Sports Bar & Grill at 320 South 8th Street for Mexican Mondays where you can pick up two beef or chicken quesadillas and a side for $7 and wash it all down with a three buck Modelo Especial or Modelo Negara all day and watch March Madness, baseball or trick yawning broadcast in English. But if you really want to watch kickball, they’ll put it on one of their 15 sets and you can sit in a corner by yourself watching two South American teams nobody cares about battle to a thrilling 0-0 score. Manager Lorenzo Church also has March Madness tournament specials, such as: “Come in for your team’s game wearing its colors and your first domestic draft or Tall Boy is on the house.” And there’s a mini basketball hoop enabling fans to shoot for a beer. Did I mention that they have two buck tall boys every day? Call ’em at 904/432-8129. Jay Robertson of Fernandina Beach’s Parks and Recreation Department reports that some 54 teams will be sharing their best rib BBQ efforts in a rib-cooking competition at Main Beach tomorrow (Saturday, March 18) with 400 rib plates ready to serve beginning at noon for $10. If there aren’t enough ribs, or folks want something else, Myron Mixon’s Tifton, GA restaurant will offer alternative BBQ. There will also be a kid zone, vendors, live music, and more with the event opening at 10 a.m. and ending at 3 p.m. Now that the weather is improving, spring is almost here with more tourists walking the streets and daylight lasting longer, piano man John Springer and drummer Rob Taylor are also lifting spirits at downtown Centre Street’s Alley Cat every Thursday and Saturday evening from 6:30-9:30 p.m. and upstairs at Café Karibo on Wednesday’s 6:30-9:30 p.m. If you’ve got the blues these two will lift your spirits while you sip a few. Sit at the piano bar if you can find a seat, or wait for one if you have to as it’s worth it. Time To Terminate The Terminal? Regarding John C. Calhoun, don't tell anybody but his son-in-law Thomas Clemson founded Clemson University in the 1890s. I wouldn't want some yahoo trying to change its name just because his father-in-law had slaves. For the record, Clemson was far more dedicated to educational goals than either Elihu Yale or John Harvard ever dreamed of. Ooops! Thanks for the correction. The city didn't mention where they were from so I assumed it was JAX. I'll correct that. Always have had a daily to read in the morning. A long standing tradition. The St. Pete Times (now the Tampa Times) the AJC and now the over-priced Times/Union/Jags rag. Do they employ a proof reader? High school newspapers have fewer errors especially in the sports section. Monday and Tuesday editions are useless with 10-12 pages throughout all sections. Considering other things to do with my $600 yearly subscription. The more I read about the nonsense taking place on college campuses, the more convinced I am that my grandsons should attend West Point, the Naval Academy, the Air Force Academy or the local technical school. Of course, I wouldn't object to Notre Dame either. That leprechaun can take a snowflake any day of the week.